He is the angry chef on TV. He, like many top chefs, has a reputation for his temper and perhaps that kind of perfectionism is part of the reason why his reputation for his temper is equaled by his reputation for food. Recently, while in London, I had the pleasure of joining some old friends to sample his signature restaurant on Royal Hospital Road. It is difficult to describe the anticipation that preceded this particular food adventure, especially since I had about a month to let it really sink in – it is difficult to book any Michelin 3-star less than a month in advance. Aside from the obvious allure of being able to spend a few hours eating some excellent food with some comparably excellent company, I was also eager to sample a 3-star from the east side of the Atlantic Ocean. 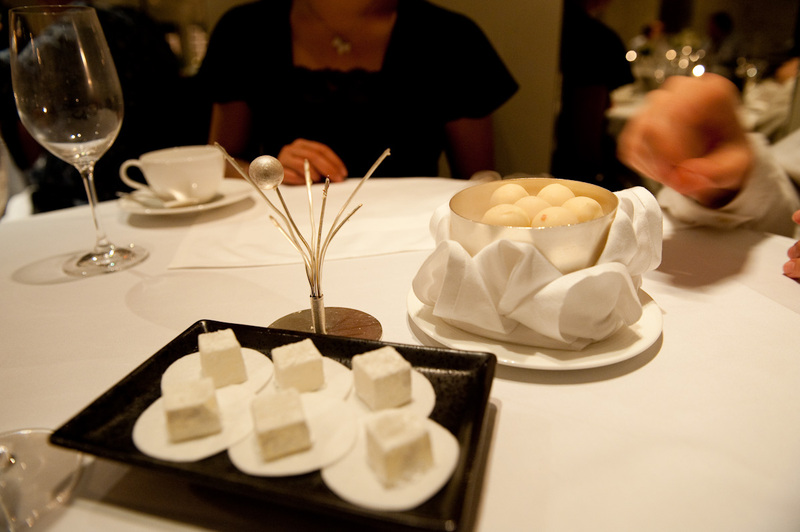 Curiously, my first “proper” 3-star experience was in Per Se, New York on the 27th of March 2007 (I know because the date was printed on the menu that they gave me after the meal). 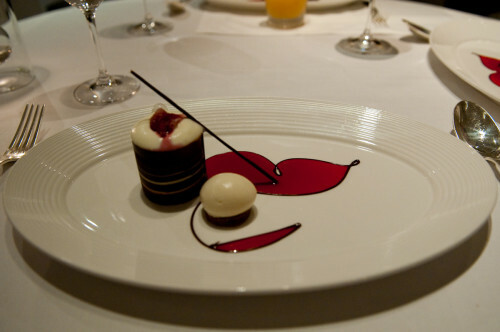 Since that time, I’ve eaten at all (two) of the other 3-star restaurants in New York – Jean Georges, and Le Bernardin. When the red guide came to New York there was great controversy because they gave four restaurants 3-star ratings in the first year (ordinarily, it is policy not to give any restaurant 3 stars in their first year of being rated), and many food writers believed that this lax in standards meant that a 3-star rating in Europe carried more weight than one in North America. Until a few days ago, I had never eaten at a 3-star restaurant outside of New York and, since I rated Per Se as my best dining experience ever, you can imagine my anticipation at eating at my first 3-star in Europe. Food is an exceptional luxury. It is not like nice cufflinks or expensive cars, because when you’re done, you have nothing to show for it. You get it, you eat it, and it’s gone. It is difficult to explain to those who don’t understand, and the more you analyze it, the less it makes sense. Many will retort with arguments along the lines of “but it’s food”. Those who take the attitude that we eat for the sole purpose of sustenance may never understand, but for others – like myself – suggesting such a thing is like suggesting that the value in the act of making love does not extend beyond the purpose of procreation. A good meal is like a journey – an adventure if you like. Like all good adventures, as many of the senses are engaged as possible, the more the merrier. Taste and smell are the obvious primary benefactors here but sight and touch also have roles on this stage. The practice of modern “tasting menus” – meals where small-portioned courses are brought out in a specific sequence as determined by the chef is said to have begun in the imperial Russian court. Prior to this, large portions of food were brought out on large plates and set in the center of the table for all to share. This new approach allowed chefs to tailor the gastronomical experience in a very precise way. It also allowed for greater involvement of the front of house aspect – the waiters, in the meals as they had to explain the dishes and ensure that everyone at a table was served at the same time. Though the setting was understated in the typical English way, the first thing I noticed was the level of service. It was very good. The attention to detail was apparent from the setting of the tables, right down to the small details, like our waiter’s Dolce and Gabbana cufflinks. Presentation alone can’t and won’t earn you three Michelin stars however, and in the most important aspect of the restaurant – the food, head chef Clare Smyth (who actually takes care of the day-to-day running of the kitchen) excelled. I visited with two other friends, which gave us the opportunity to sample a wider variety of dishes than we would normally have been able to. For starters, we shared thirds of a dish of foie gras, a terrine of trotters and pork belly, and a curious mixture of veal and seared tuna. It often surprised the palette that items that were seemingly secondary to the dish stood out, like the salad that came with the tuna, and some of the sauces that accompanied the foie gras. Some dishes we all shared, like the lobster ravioli. When I think of ravioli, I normally think of large postage stamps of pasta filled with some indeterminate meat product inside (and in cheaper establishments, some kind of plastic product that may contain traces of meat). This was different, the dish of lobster ravioli consisted of a single ravioli (raviolus? raviolii?) which was slightly smaller than a clenched fist in size, and possibly a little less thick. The taste, however, was overwhelmingly that of the lobster rather than the ravioli (if you’ve ever lived on tinned ravioli, you will understand the importance of this distinction). But it’s not just like eating a lobster, oh no. Imagine taking two or three lobsters and somehow compressing not only the taste, but the entire sensation of consuming… inhaling, even… lobster meat, and you will have a close approximation of the experience of this fine lobster ravioli. The mains, like the entrées, were similarly interesting and varied. Lamb, pigeon, and rabbit were sampled, and while neither was particularly exotic (at least not by my standards) the dishes were extremely well-executed. The ingredients were obviously of the very highest quality, but the care in their preparation allowed the experience of consumption to do justice to the quality. And I may well have eaten some of the smoothest, most delicately textured meat I’ve ever had in the rabbit kidneys that accompanied my terrine. 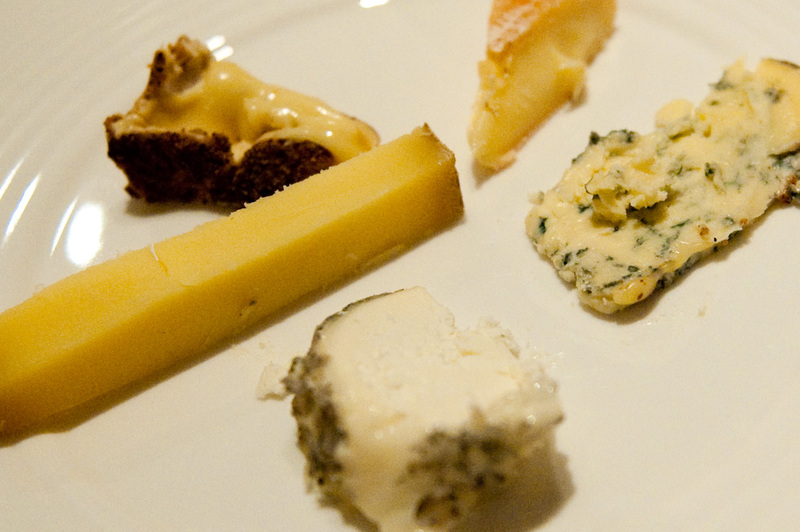 A fine and impressively wide variety of cheeses presented themselves to be chosen from the trolley, and even the “lightest” cheeses came with strong and complex taste (and often aftertaste) sensations. The most common surprise in this case being that the smell of the cheese often contrasted strongly with the taste that resulted from the reaction of the cheese with one’s taste buds. The selection of desserts, which included a most delightful and unusually light rendition of Turkish delight (foreground in the title image) was an appropriate and fitting end to an exceptional dining experience, which I capped off the way I always do – with a nice cup of Earl Grey Tea. The big question that remains of course, is how does it rate next to some of the other fine dining establishments that I’ve sampled over the years. Only time will tell. I don’t mean to say that just to be cryptic (although it does make me sound very mysterious for a food reviewer). It is often the case that immediately after a good dining experience one exclaims that it is the “best ever”. It is often only quite some time after the act, that the real value of the meal in the context of all the other meals I’ve eaten begins to sink in. For example, in Hong Kong once, I ate at “Amigo”, “Spoon, by Alain Ducasse”, and “Gaddi’s” on consecutive nights and honestly believed at the time that each night was slightly better than the last. However, looking back, the experience at Spoon has shown itself to stand fast near the top of my rankings while the other two have fallen away somewhat. The first impression is thus: it is good, very good, but not as good as Per Se. One of my dining companions commented that it was not as good as Vue de Monde in Melbourne. I am more hesitant about that assessment because, having been to Vue many times, the time I went with this companion was an exceptionally good experience – definitely more highly rated than this one – but was not typical of Vue, which I would rank slightly lower than Gordo’s. The restaurant which I would rank this closest to is Tetsuya’s in Sydney, which was an exceptionally good experience although difficult to compare because the cuisine is significantly different. As far as the question of the deservedness of Michelin stars is concerned, Per Se definitely deserves three stars, (as does Tetsuya’s). As I would rank Per Se significantly above both Jean Georges and Le Bernardin, I would say this – if the other two New York restaurants truly deserve three stars, then so does Vue de Monde, but if not (and my suspicion is “not”), then it is impossible to say (yes, this is a logic puzzle). As far as the much more important questions are concerned, the answers are as follows: Yes, the food is amazing; yes, the food is totally worth it; yes, I would definitely recommend Restaurant Gordon Ramsay. Excellent review. I particularly like ‘the entire sensation of consuming… inhaling, even… lobster meat’. It makes me want to eat it again. oh yes! It took me a while to write this actually because every time I started, I would write a paragraph, then get hungry and duck out to get some food.